Metamerism is a visual phenomenon which can be caused by a number of different factors. The result is that two samples may look the same under some conditions and different under others. The most common cause of metamerism is that the pigmentation used to make a match is different than that found in the standard. The spectral curves are different even though the L*a* b* values are the same. The effect of different light sources reflecting off of the different materials results in a visual color difference between the two under some lighting conditions. Illuminant metamerism occurs when a pair of materials appear to match when viewed under one light source, and then appear to mismatch when viewed under a second light source. 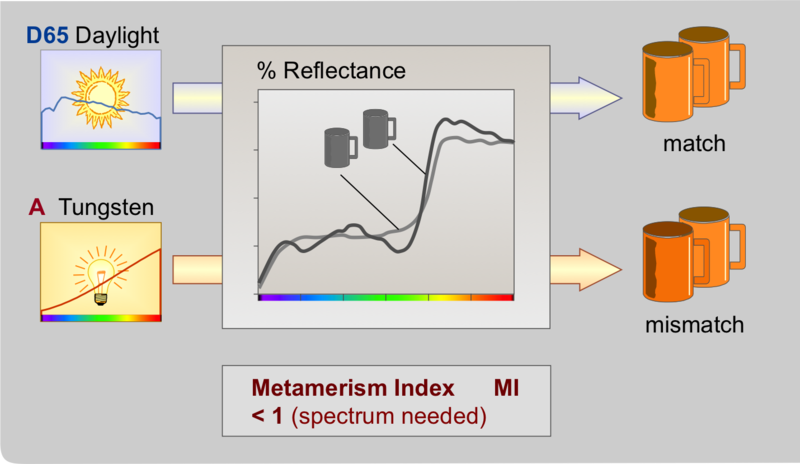 Metameric pairs have spectral curves, that cross at least three times.In instrumentation the MI (Metamerism Index) is used. Often the difference in pigmentation is hard to avoid. The pigments (dyes) used in automobile interior fabric will likely be different than that used in the interior plastics, resulting in a good match in some lights and a poor match in others. Manufacturers often accept a good match in daylight, and live with the metamerism seen under fluorescent or showroom lighting. Metamerism can also be caused by a difference in geometry. This is most often seen in fabric where the weave or nap of the fabric causes a difference in apparent color, depending on the angle of view. In this case the metamerism is planned and considered to be a desirable quality.